Wedged between the Kalahari and the South Atlantic, in the south-west of Africa between the Orange River in the south and the Kunene river in the north - Namibia boasts deserts, seascapes, bushwalking, and boundlessness. Blessed with rich natural resources, a solid modern infrastructure, diverse cultures and an annual quota of 300 days of sunshine, it is a beautiful country of vast potential. It’s an arid, rough land, the world’s 34th largest country, a different world, but still inviting, strangely familiar and easy to travel. Namibia is a photographer’s dreamland, a land of contrasts and clear colors. It’s not for those, who like busy beaches and have fun in crowds. It’s one of the most scarcely populated countries on earth after Mongolia. But if you love nature, stillness, grandiose landscapes, desert, and expanse, Namibia’s for you. But Namibia isn’t just silence and wide open spaces. There is dune buggy racing, horse racing, and dune skiing. Namibia has a colorful and turbulent history. Because Namibia has one of the world’s most barren and inhospitable coastlines, it was one of the last African countries to be colonized. Essentially a desert country, Namibia offers contrasting landscapes. The Namib Desert – believed to be the oldest desert in the world – is a vast swathe of high dunes and desolate plains with an awe-inspiring sense of space. It is the oldest desert on the earth with a unique flora and fauna. Millions of years ago the Orange river washed diamonds into the sea. Currents, waves and the wind transported them into the sand dunes of the Namib, thus creating a source of natural wealth for Namibia. Avid rock climbers should venture into Spitzkoppe located between Swakopmund and Windhoek knew as the Matterhorn of Namibia. You can visit the Namib Naukluft Park, the fourth-largest conservation area in the world, where oryx stroll over apricot-, ochre- and fawn-colored dunes tufted with grasses. The oryx antelope has become perfectly adapted to the climate. Springbok, kudu, ostrich, baboon, mountain zebra and leopard are also found here. Although apparently empty, the Namib teems with life, much of it unique to this landscape. The number of insect species is estimated at 20.000. Also among the reptiles some of the species – like the transparent Palmato Gecko – are endemic. And in Namibia, all the southern African snake species can be found, some of them poisonous like the Puffadder, Black Mamba, Green Boomslang, Cape Cobra and Spitting Cobra. You can watch rare desert-adapted elephants as they browse the trees in the dry beds of the Ugab and Huab Rivers in northern Namibia, or dig down into the earth with their tusks in search of water. These trees from the “dead Vlei” have been dead over 600 years. 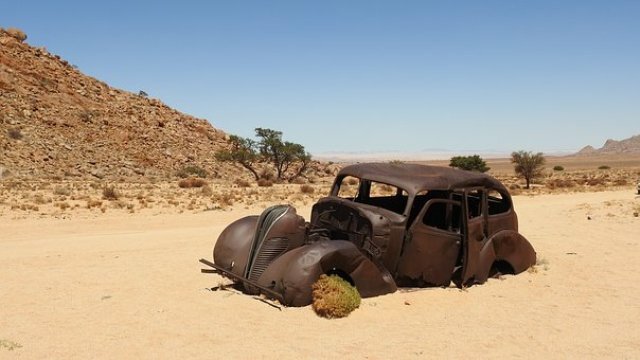 Or you can explore the mysteries of the vanishing ghost towns of the Namib desert. Namibia is one of the best game countries in Africa. Early in the 1900s, people started to take the protection of wildlife seriously and game reserves, like the 20.000 SQ km Etosha National Park, was established. Today a total of about 120.000 SQ km, some 15% of the entire country, fall under nature conservation, not to mention the many private nature and game reserves. Namibia is a gem for those in search of wildlife and wilderness. It’s a country of compelling beauty, abundant sunshine, and unconfined space. This feeling of tranquillity and stillness combines with a landscape which is singular in its colours, full of contrasts of light and shade.